Small World Underground, the new stand-alone addition to the Small World universe is now available at game stores throughout North America, as well as all of Europe. With all new Races and Special Powers, new maps and terrain types, plus Monsters protecting Righteous Relics and Popular Places, isn’t it time to go subterranean? 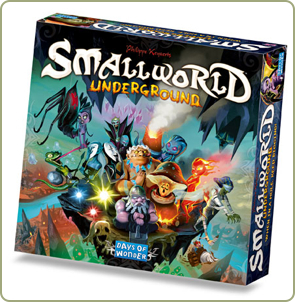 Learn more at the Small World Underground Page or head to a game store near you to check it out. Days of Wonder have added the Small World Underground boardgame to their online store in the EU and for pre-order on their US store. Days of Wonder, a leading publisher of top-quality, family-oriented board games, announced Small World Underground, a stand-alone game set beneath the surface of the fun, light-hearted Small World universe of epic conquests and fallen empires. Designed by Philippe Keyaerts, creator of the original game, Small World Underground is a follow-up to the award-winning Small World, a fantasy civilization game where players vie for conquest and control of a world that is simply too small to accommodate them all. Recipient of many accolades, the original Small World sold more than 100,000 copies to date and is available in 10 languages. Small World Underground follows the rise and fall of new whimsical Races and Powers that lie beneath the surface of the original Small World. It also introduces Monster occupied regions that protect Relics and Places of great power. It can be played on its own or combined with other Small World game elements and is recommended for players who are already familiar with Small World.